...or making parts by adding material rather than taking it away. The 3D printer is now an essential piece of equipment in our workshop. We've been using a Threedy Large to produce items such as bobbins, gears, housings and other items for our own use. With the recent acquisition of a small desktop machine and the experience we've built up working on our own projects, we can now offer a fast printing service. File in STEP or IGES or other format? We can probably convert it. Don't have 3D CAD? Send a dimensioned sketch or 2D projections and we'll make the 3D model and then print it. Stocked materials are PLA, ABS and PETG in various colours. 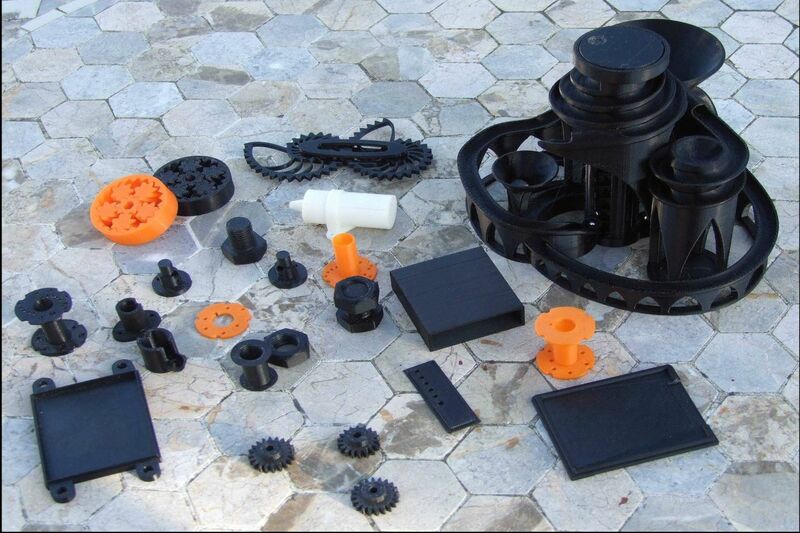 Orange parts are PLA, white coil case is ABS, various black gears, housings and bobbins are ABS, the marble run is PETG.